The 1.2 acre fenced in Dog Park is located at Plum Grove Reservoir on Algonquin Road adjacent to the southeast corner of Harper College. The 2018 season will run January 2 through December 31. Registration is accepted year-round and forms can be downloaded online or are available for pick-up at Community Center, Birchwood Recreation Center, or Falcon Park Recreation Center. Resident registration for dog park passes began on December 1. All registrations must be accompanied by documentation of current vaccinations (rabies, DA2PP, bordetella, test for internal parasites) and Village of Palatine animal licenses. Fees are $45 for the first resident dog, and $10 for each additional dog up to a maximum of three dogs per household. Dog park registration for non-residents began on January 2. All registrations must be accompanied by documentation of current vaccinations (rabies, DA2PP, bordetella, test for internal parasites). If animal licenses are required by the village in which you reside, documentation must be provided. Fees are $57 for the first non-resident dog, and $13 for each additional dog up to a maximum of three dogs per household. Please Note: For dog bites or any other emergencies, please call 9-1-1. 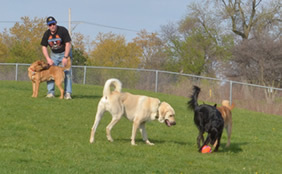 The dog park is to be used only by dogs registered with the Palatine Park District. To be registered, dogs must have current vaccinations (distemper, hepatitis, kennel cough and rabies). All dogs must also have a valid dog license from the Village or City corresponding to the dog owner’s home address. Dogs must always wear the appropriate registration and license tags. Registration is for the calendar year purchased. Registration fees are non-refundable and non-transferable. The dog owner agrees to assume the full risk of any injuries, damage or loss connected with or associated with the use of the Dog Park. Dogs must be leashed while entering and exiting the park. Handlers must have a leash at all times. Children must be at least 6 years of age and accompanied by a parent or guardian to enter the dog park. Dogs in heat (estrus) are not permitted in the park. Cooperation between handlers is expected and required. Handlers must immediately pick up after their dog(s) and fill all holes their dog digs. No food meant for human consumption or meals for dogs are allowed. Dog handlers may give dog treats only to their dog. Handlers are limited to two dogs per visit. Infractions of any park rules may result in temporary or permanent revocation of a dog’s registration and the privilege to use this park.